"From 1888 to present, the small tower at Cattle Point on San Juan Island in the Strait of Juan de Fuca, has guided mariners by light and foghorn through some of the thickest fog in the area. In the early 1850's, cattle and sheep were brought to the island and off loaded near where the lighthouse stands, thus the name 'Cattle Point." 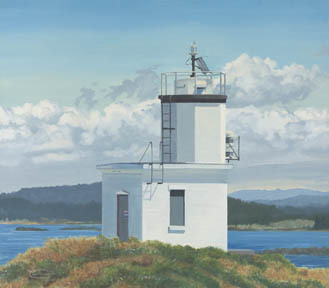 Artist comment: "Cattle Point Lighthouse" is a small but vital light on San Juan Island, Washington. It's light is automated and maintained by the Coast Guard. I painted her on a beautiful spring day as the grass was beginning to 'green up'! I sketched the composition with the tower just slightly off center. Using oil paint, I sketched the scene, then began with the sky and background (loved those clouds!). With a steady hand I painted the shadows first, then the whites. The darks were the final touch (the glass light was a fun challenge)." "Cattle Point Lighthouse" is a limited edition, giclée print from an original oil painting by Carol Thompson. The edition includes 3600 authorized, signed, limited edition prints (3500 numbered and 100 artist proofs). Release date is November 1998. Image size and substrates vary. All prints are signed and numbered by the artist and include a certificate of authenticity. Paper prints are shrink wrapped on foam board. Canvas prints are coated with a protective spray.